Members of Kaizen Team 1 learning the basics of kaizen before going to the shop floor. Sensei Nakao is at right. 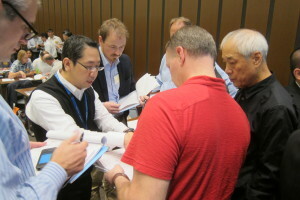 I have just returned from Shingijutsu’s 64th Japan Genba Kaizen Seminar. In addition to being a world-class experience, there were dozens and dozens of valuable learnings. I’d like to focus here on one particular learning: What kaizen is compared to what kaizen has become in many organizations. Shingijutsu teaches that the purpose of Toyota’s production method is to improve productivity. Its goal is cost reduction, and the sub-goals are quantity control, quality assurance, and respect for humanity. These goals are dependent on one another, not independent. That means that productivity improvement must not come at the expense of the goals or vice versa. If what you call “kaizen” is not resulting in the achievement of the purpose, goal, and three sub-goals, then you are not doing kaizen correctly and your pursuit of Toyota’s production method (a.k.a. Lean) is flawed. The means by which the purpose and goals are achieved is by carefully analyzing the work that people do and eliminating waste, unevenness, and unreasonableness. If you are not carefully analyzing work, then you are not doing kaizen. This is what kaizen is. This is the basics of kaizen. You must master the basics. If how to use a stopwatch and these one-page forms are unfamiliar to you, then you are not doing kaizen. But you say, emphatically, “We are doing continuous improvement!” That may be, but you are not doing kaizen. You are probably doing something akin to quality circles (typically, close to the pure form of a suggestion system), which is a necessary activity but in no way is it a substitute for kaizen. My observation is that kaizen in manufacturing businesses more closely follows the true nature of kaizen (though there are plenty of exceptions). However, in service businesses – particularly healthcare, higher education, and financial services – kaizen is actually a quality circle activity augmented by process mapping (value stream maps), A3 reports (or PDCA), and gemba walks. This is what kaizen has become. Doing this will yield little in the way of productivity improvement or cost reduction, though it could have a small favorable impact on quantity control, quality assurance, or respect for humanity. Think critically about your years-long Lean efforts: Has it achieved the expected results in terms of productivity improvement, cost reduction, quality control, quality assurance, and respect for humanity? Has it dramatically changed, for the better, how people do their work? If not, then you have to ask yourself, “Who have we been influenced by to think that kaizen is quality circles, and that value stream maps, A3 reports, and gemba walks improve work and help make work flow?” Are you doing these things because they are easy to do or because that is what people will agree to do? That’s no good. In most cases, people have been strongly influenced in their kaizen practice by people who do not know kaizen and who have introduced or created new tools that appear to help improve processes. Yet, processes have not actually improved unless work has been carefully analyzed to determine takt time, cycle times, capacity, and standard work to improve flow. Whether it is at this moment or sometime in the future, you will realize that it would have been far better for you to have been influenced long ago by people who really know kaizen.